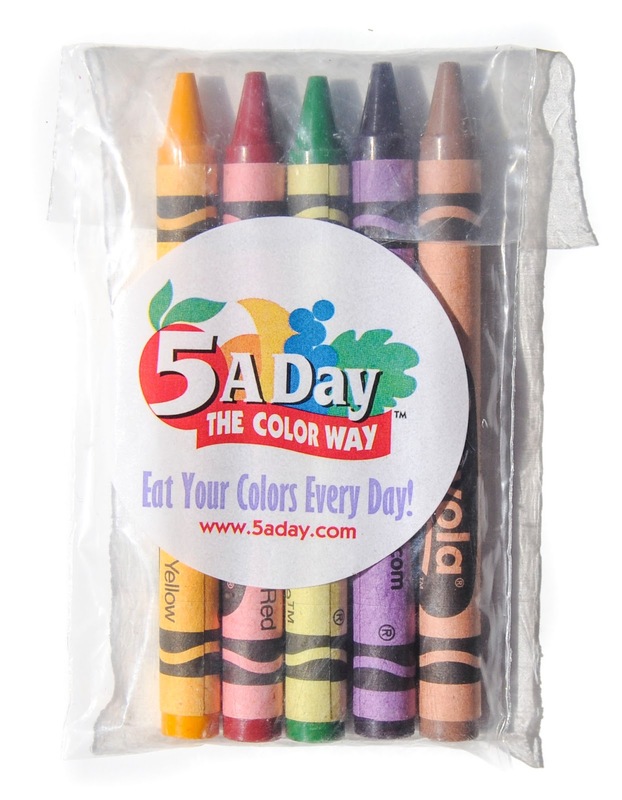 The Crayola 5 A Day the Color Way set of crayons came out in 2003 along with the 5 A Day The Color Way campaign. The campaign was put out by 5 A Day the Color Way in partnership with Crayola and Dole. It encouraged educators to teach children to eat "5 or more servings of colorful fruits and vegetables" and to "develop healthy eating habits." The theme was "there's a rainbow on my plate." Corresponding crayons and a coloring book came out to signify all the colors to eat. There was also lesson plans, activity sheets, produce department tours, games, books, posters, and classroom kits. One of my favorites was an activity sheet to track all the colors they ate during the day. How easy would it be for kids to mark the color they ate that day? (source: 5 A Day The Color Way archived website) I personally have a unit in preschool where I show kids all the vegetables and take them to a farm. They love it and end up trying more than they would have. We have also gone on grocery store tours too which my kids also love. Search for these on eBay, may or may not be available. "Deeply hued fruits and vegetable provide the wide range of vitamins, minerals, fiber and phytochemicals your body needs to maintain good health and energy levels, protect against the effects of aging, and reduce the risk of cancer and heart disease." The colors of the crayons represented these different varieties of fruits and vegetables. All the colors helped reduce the risk of some cancers. 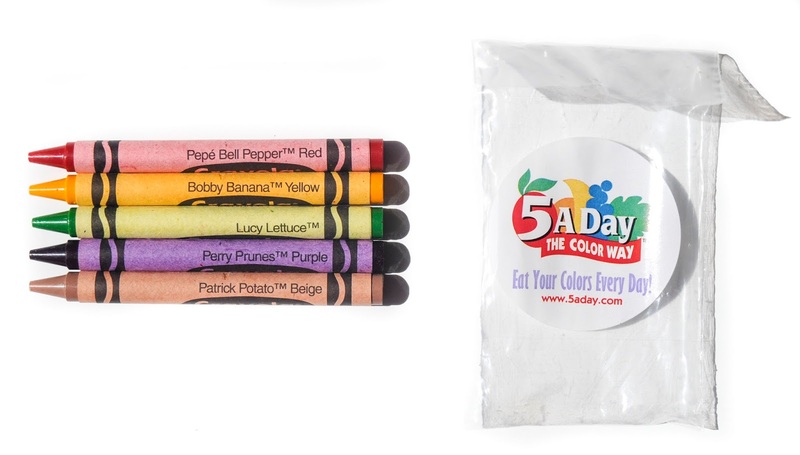 Here are the other benefits listed on the 5 a Day The Color Way archived website. Purple fruits and vegetables "fruits and vegetables contain varying amounts of health-promoting phytochemicals such as anthocyanins and phenolics, currently being studied for their antioxidant and anti-aging benefits." They can help your memory, aging process, and urinary tract. Green "fruits and vegetables contain varying amounts of potent phytochemicals such as lutein and indoles, which interest researchers because of their potential antioxidant, health-promoting benefits." They can help your vision, bones and teeth. "White, tan, and brown fruits and vegetables contain varying amounts of phytochemicals of interest to scientists. These include allicin, found in the onion family. " They can help your heart and cholesterol levels. "Orange and yellow fruits and vegetables contain varying amounts of antioxidants such as vitamin C as well as carotenoids and bioflavonoids, two classes of phytochemicals that scientists are studying for their health-promoting potential." They can help your heart, vision, and immune system. Red fruits and vegetables contain "specific phytochemicals in the red group being studied for their health-promoting properties include lycopene and anthocyanins." They can help with "memory function, urinary tract health," and help the heart. This is one of my favorite promotions that Crayola has done. I am big into getting children to eat better and this is a perfect way to do so. It is interesting to not that they trademarked all the names. The interesting thing about this package is there is no UPC, style or code number. It is just a sticker on the front of the package, which is very unusual for Crayola.